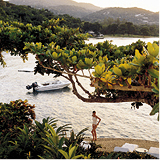 Stressed-out, aching masses, welcome to one of the world’s great spa destinations. Scottsdale is home to some of the most luxurious facilities you’ll find anywhere, and even if you’re not the “spa type”—I’m not sure who those people are, but I hear they exist—these lavish temples to relaxation shouldn’t be missed. They will knead, stretch, scrub and buff your worries away. Book a massage or facial at one of these mega-spas and spend the entire day taking advantage of the pool, gym, fitness classes, quiet gardens, steam rooms and saunas. These spas also serve healthy and delicious menus all day—though you’ll find more indulgent dishes (and cocktails!) if you had a more of treat-yourself day in mind. If the prices seem a little high, consider a summer visit, when most Arizona spas offer seasonally discounted packages. Prepare to be awed. The spa at the Scottsdale Princess resort is a massive, beautifully designed tour de force. Select from a customizable menu of massages and body treatments, nutrition assessments, fitness training, salon services and acupuncture. The waterfall “canyon” oasis and rooftop pool will lure you outside, while the sauna and steam rooms, whirlpools, Swiss showers and eucalyptus inhalation rooms will bring you back inside. You’ll never want to leave this Moroccan-themed complex and its Hammam-style facilities. In between treatments, enjoy the rooftop pool terrace with views of Camelback Mountain, or the quiet whisper lounges, serene areas with comfy daybeds and flickering candles. For a real splurge, try one of the suites, which offer private terraces and outdoor showers. A chic makeover transformed this 1960s “tennis ranch” into a modernist Zen retreat, complete with relaxation lounges that overlook a reflecting pond and meditation garden. Take a yoga or Pilates class in the morning, then book one of the Asian-inspired treatments for the afternoon. The private outdoor suites and mountainside locale make Sanctuary an extraordinary destination. The 33,000-square-foot spa at The Boulders resort infuses Native American traditions and the Southwestern desert landscape into its one-of-a-kind experience: treatments with desert salts and sage oils, turquoise clay wraps and meditation sessions in an onsite teepee. Looking for a little adventure with your pampering? Private bouldering, climbing and mountain biking sessions are available. The Scottsdale Hyatt Regency’s spa seamlessly blends indoor and outdoor relaxation spaces. Glass walls slide away in the separate men’s and women’s lounges, opening onto intimate patios with outdoor showers and hot-and-cold plunge pools. Book a massage in a garden treatment room, then spend the day by the French-Celtic mineral pool and lotus pond.